What exactly is a cloud dough recipe for? Well, my kids play in it as though it were sand. I put it in a huge long, shallow container and they are entertained for hours. I usually have a lid so I can keep it and shove it under the bed when they are done playing with it. I like this better than sand for a couple reasons. It’s like a soft massage when you get your hands in it and mold anything out of it. If it accidentally gets in your eyes, it won’t scratch them. And it’s cheap to make. I’ve been wanting to make a cloud dough recipe for a long time but most of the recipes I’ve seen use baby oil. My kids are a bit older and don’t like the smell of baby oil so that was not an option. I’ve been experimenting with this recipe and I finally perfected it! 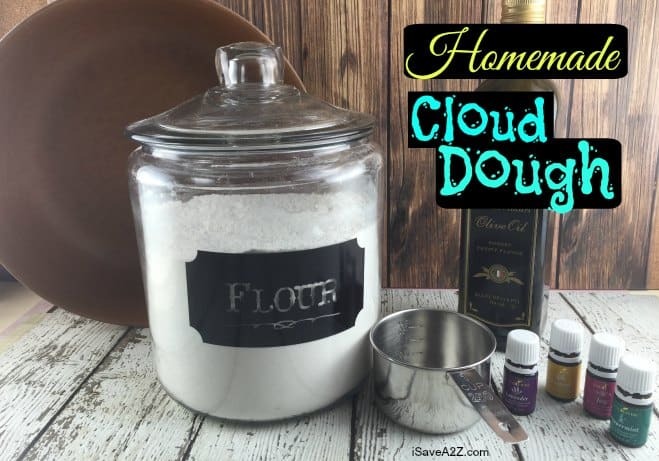 I was able to make a homemade cloud dough recipe with essential oils! I’ve made some amazing smelling cloud dough that my kids LOVE! Love I say!!! Ok, here’s how you make it. Optional Essential Oils: The kids love lemon, peppermint, lavender and Joy from Young Living. If you need to know where to buy essential oils read this post here. There are two ways you can combine these ingredients. Start by measuring up 8 cups of flour. Then measure out the olive oil. You can add the essential oils to the oil or directly to the dough after you’ve mixed it a bit. I wanted to make four different scents so I combined the oil with the flour and partially mixed in the oil enough for me to separate into four different bowls. Then I added about 5 drops to each separate bowl and mixed in thoroughly. By Jennifer on March 2, 2015 Crafts, Essential Oil Craft ideas, Essential Oils Recipes. Hi Jennifer. Do you know if it is possible to add food coloring to the dough mix so you can make different colored dough like play dough? How long does the home made dough last? Would the dough smell terrible if you didn’t add an essential oil? Does this dough work for making beads or other objects or is it only for play? No this is only for play.